Want to smell like your favorite fandom? Now you can with these Supernatural themed roll-on perfumes! Each scent was a custom blend that we believe fits each character the best! Each glass roller bottle is packaged and labeled at 10ml/0.33oz and comes shrink wrapped! I Lost My Shoe - Scented in Old Books and Musk. Sonovabitch - Scented in Whiskey, Leather, and Apple Pie! Smells like every bad decision you enjoyed making! Baby - Scented in pure Leather. What other scent would our baby have other than just pure leather? Idjits - Scented in a mixture of Kentucky Bourbon and Whiskey. Enjoy the manly scent of grumpy old men who like their alcohol! King of Hell - Scented in Bonfire, Cinnamon, and Leather. Enjoy our Crossroads King of Hell with this fiery scent. Only the best for our King! Baby In a Trench Coat - Scented in Clean Cotton. One of our best sellers. It's a nice clean, airy scent. Perfect for our baby angel. Trickster Archangel (formally known as Snap! I'm an Archangel) - Scented in Musk and Gummy Bears! Our other best seller! This Archangel blend will leave you smelling nice and craving gummy bears! You Betcha - Scented in Cinnamon Glazed Doughnuts. Smells like warm doughnuts freshly dipped in a gooey glaze, then coated in a blend of warm cinnamon and slight vanilla musk maple. What better way to scent this wonderful lady than with one of her favorite treats? Mega Coven - Scented in Witching Hour. It smells like freshly ground cinnamon bark, lemon, orange, and raspberry, and in complemented by herbal notes of bergamot, cannabis flower, jasmine, carnation, tuberose, hydrangea, calla lily, and rose, and it all rests upon an earthy base notes of sandalwood, black tea, ylang ylang, sheer musk, tonka bean, and oak moss and patchouli with a hint of baby powder and vanilla. A very mysterious scent for our favorite mysterious witch! Clarence's Unicorn - Scented in Dragon's Blood and Fresh Fruit. 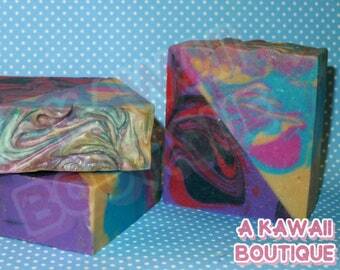 This blend features a blend of orange, carnation, and rose, on a warm exotic dry down of patchouli and creamy vanilla. It has slight undertones of tangy guava, sweet passion fruit, pineapple, strawberry, pear, and freshly peeled orange. Perfect for our dark, yet sweetly mysterious unicorn lover. Please note: Since these are made in very small batches, colors can very from batch to batch. If it's super important to get the right colors, please contact me. 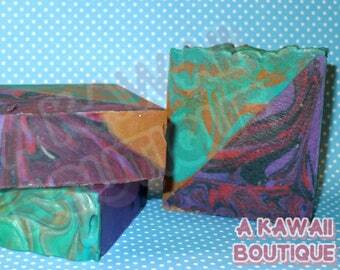 Ingredients: Clear Jojoba Oil, Essential Oils, Fragrance Oils. 1: Shake the bottle to mix it up. Because this is an oil based all natural perfume, it should be gently shaken before application. 2: Apply where you desire. I recommend these spots: Temples, neck, wrists, behind the ears, and chest.